The 2,708m-high Poás Volcano is one of the most active volcanoes in Costa Rica, located 35km northwest of the capital San José. This stratovolcano contains a 300m-wide crater lake called the Laguna Caliente (‘hot lagoon’) filled with naturally hot, very acidic concentrated chloride-sulphate brine. Knowing the volume and bathymetry of the lake is crucial in monitoring and predicting the behaviour of this active volcano, but there is no recent bathymetric data available. 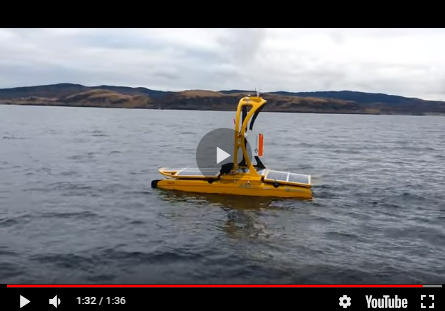 In this article, the authors explain how they developed a cheap and portable, sonar-equipped unmanned surface vehicle (USV) and used it to survey the lake. The pH of the Laguna Caliente is as low as 0.5 and the temperature is 55 °C and higher. The lake’s surface is frequently disturbed by small but impressive phreatic explosions. These extreme conditions are caused by the discharge of magmatic gases into the bottom of the lake. Energy and mass balance calculations are based on survey data taken during the year 1994 when the lake had completely dried out. Meanwhile, the lake has filled up again and the geometry has probably changed considerably since that time, both by sedimentation and due to big phreatic explosions, like the one on 25 February 2014 that ejected water, sediment and rocks 400 metres into the air. Collecting bathymetric data in these extreme conditions is a daunting task. The lake is too hazardous for human access so a USV is the only option. However, no one wants to risk valuable equipment in this hell hole. After a visit to the lake in 2015, we took on the challenge to design and build a cheap and easily transportable sonar boat with readily available and inexpensive components. It had to be cheap because the risk of losing the prototype was extremely high. And the boat had to be light and small enough so it could fit into airline baggage as well as being easy to carry in a backpack across challenging terrain. A radio controlled boat seems to be a logical choice, but visibility is often very poor over the steaming crater lake, therefore the boat had to be autonomous. This also created the opportunity to design a set of preprogrammed missions making repeated measurements over time possible. The choice of autopilot was easy because we had experience constructing different multicopters based on the ArduPilot autopilot suite. The controller of choice was the affordable Pixhawk controller with an external U-Blox GPS module (2.5m horizontal accuracy), running open source ArduRover firmware. For our ground control station we used the Windows-based Mission Planner developed by Michael Oborne. The hull of the boat was a very cheap second-hand bait boat found on a flea market. This boat had the perfect dimensions and was made from ABS. This type of plastic has good qualities for the extreme environment in which it had to function. The catamaran design of the bait boat was an extra advantage favouring the stability of the sonar platform. The two hulls of the catamaran where filled with PU foam making the boat unsinkable. We didn’t want to use a conventional propulsion system with a water propeller and a shaft piercing the hull. The metal shaft would be too vulnerable and therefore unreliable in the hot acid. In fact, during the construction of the boat great attention was given to using as many plastic parts as possible, which are more resistant to acid than metal. Instead of an underwater propeller, a 12 inch carbon fibre air propeller driven by a 350W brushless motor mounted on a servo-controlled rotatable vertical mast was built. The carbon fibre guaranteed form stability in the hot atmosphere above the lake. The end result was a USV weighing less than 10kg and measuring just 540 x 380 x 220mm. The choice of the cruise speed was important. Different factors played a role. First of all, the geometry of the boat and the position of the propulsion pushed the bow into the water when gaining speed. So the bulk of the weight was put in the stern. The second consideration was the sampling time of the sonar versus the distance travelled during that time. The speed had to be low enough to get a satisfying resolution. The last factor was temperature; the boat had to operate in water of 55°C. So it became important to minimise the current drawn from the batteries which would otherwise produce too much extra heat in an already overstressed system. All these considerations resulted in a cruise speed of 0.8m/s or 3km/h. Operating at this speed and powered from two parallel 5Ah 12.6V lithium-ion polymer batteries, the USV runs autonomously for nearly three hours. The sonar was an inexpensive Lowrance Hook4 with a HDI Skimmer 83kHz-200khz single beam transducer with 22° beam angle (200kHz), good enough for a first prototype USV. The data was saved on an SD card and after finishing the mission the data was processed with the very affordable ReefMaster software from Australia. ReefMaster is a Windows application combining graphical track and waypoint management with underwater mapping. In the summer of 2016, the authors, together with Joyce Lundberg and Carlos José Ramírez Umaña performed the actual survey. The USV had survived the transcontinental flight from Europe to Costa Rica and was deployed in 20 minutes upon arrival at the lake. For the deployment we were equipped with gas masks, helmets, raincoats and the warning to drop everything and run in case of a big phreatic explosion. The gas masks were necessary because the air can become unbreathable due to toxic sulphurous fumes. A survey plan had been designed in advance with the Mission Planner. The software uses satellite images provided by Bing Maps. However, this service does not provide a creation date, so we had no idea if the lake still had the same dimensions. We took care while designing the survey track to stay more than 25m from the ‘Bing-border’ of the lake to avoid grounding the USV. We also avoided the dangerous centre of the lake with its frequent phreatic explosions. A circle with a radius of 50m was declared a no-go zone. The track crossed this zone only twice and in a straight line in order to collect sufficient data to create the map. The total length of the track was 1.44km requiring about 30 minutes to survey. Knowing this time was important because no visual confirmation of the position was possible as a result of the dense fog over the water. In fact, the first time we deployed the USV the Return-To-Launch command was given soon after the start of the survey because we had no clue at all if the boat was still functioning. After intense minutes of waiting the boat emerged from the fog in full working condition, notwithstanding the extreme conditions. During processing the bathymetric data with the ReefMaster software we discovered a big hole in the centre of the lake at a depth of 26 metres where the sonar did not collect any bathymetric data. At the other side of the hole the sonar started to collect data again. So this was not a malfunctioning of the sonar, but the sound waves being absorbed by a layer at 26m depth. The scientific literature about Poás does mention a molten sulphur layer at the bottom of the lake. This layer originates from sulphur-rich magmatic gases condensing in the water. At a depth of 26 metres water boils at 140°C. This is way above the melting point of sulphur which is 115°C. Also the density of sulphur is about twice as much as water, so it collects and stays at the bottom. An error analysis was done on the acquired data considering that both horizontal positioning as well as the echo sounder are not professional instruments from a hydrographic perspective. Considering the slope of the lake (20°) the effect of the transducer is limited on the final depth readings. The main issue is the speed of sound in this specific environment. As there was no speed data in the literature for this type of environment we did an error analysis. Considering that the Lowrance transducer has temperature compensation we assumed that actual surface temperatures (up to around 55° C) were taken into account. We considered the temperature distribution which is generally uniform up to the bottom. The main influence that is not considered is that of salinity with a measured salinity of 77.6 PSU giving a potential increase of around 60m/s and a potential depth error of around 4% of actual depth. With an add-on ReefMaster module we calculated the surface and volume from the sonar data. Based on the data collected in the summer of 2016 and without correction, Laguna Caliente measures 71,387m² and has a volume of 974,207m³. With a small budget we were able to build a USV which collected bathymetric data of an active acidic crater lake and delivered convincing results. This can open new opportunities to monitor the 30 or so volcanoes worldwide with similar lakes. For follow on projects a narrower beam transducer as well as a fast reacting temperature sensor would increase overall accuracy of the measurements. Also a simple method for taking a temperature profile would be helpful in order to confirm the assumed temperature profile in the lake. An option would be to build a radio controlled reel with an sensor pod measuring density and temperature. Video 2: Early prototype of the boat. Video 3: Designing the USV and fieldwork at Laguna Caliente. Widespread volcanic activity has meant that Laguna Caliente disappeared in April 2017, and that the national park, museum and visitor’s centre will be closed until further notice.